The Nokia 8.1 will go on sale in India on 6th Feb via Amazon. The phone is priced at Rs 29,999. We are comparing the device with Honor’s latest device View 20, which also comes around the same price. The Nokia is all set to launch its Nokia 8.1 in India on Feb 6. It will be the first time the phone will go on sale in India. The phone has a 20MP selfie camera along with a 6.18-inch FHD+ preview display. On the other side, we have the Honor View 20, which is available in India at a price of Rs 37,999. The phone is the first device by the company that features a 48MP sensor on the back. 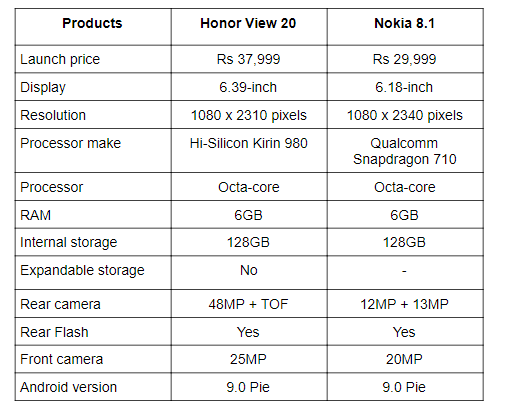 So, let’s begin with a quick specs comparison first to know what these two devices pack under their hood. The Honor View 20 sports a 6.39-inch display that offers a resolution of 2310 x 1080 pixels. The phone has a punch hole cut out at the front for a selfie camera, which makes this smartphone almost bezel-less. On the other hand, the Nokia 8.1 sports a slightly smaller 6.18-inch display that comes with a resolution of 1080 x 2340 pixels. 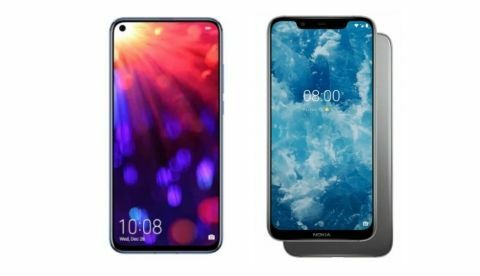 When it comes to the processor, the Honor View 20 is powered by the latest Kirin 980 octa-core processor, which is paired with 6GB RAM and 128GB internal memory, while the Nokia 8.1 is backed by the Qualcomm Snapdragon 710 processor, which is coupled with 6GB RAM and 128GB internal memory. As far as the cameras are concerned, the Nokia 8.1 has a 20MP selfie camera and a dual 12MP + 13MP camera setup on the back. The Honor View 20 highlight is also its rear camera. The phone has a 48MP sensor, which is accompanied by a TOF 3D sensor. The phone features a 25MP unit on the front. The Nokia 8.1 will go on sale in India on February 6 via Amazon, while the Honor View 20 is available on the platform for Rs 37,999.